Is this your missing McGinnis cover? Abject apologies for the abysmal quality. That's it! Thanks for finding it, it's the first time I've ever seen it in color. I'm sure a better quality image will show up sooner or later. The recent Blogspot outage deleted the following comment, posted on May 12. Thanks, "cwogle," for the link! Hey, Steve. 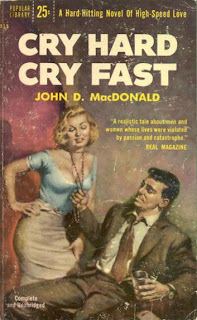 I've been enjoying your blog as I read about and look for some of the earlier non-Travis McGee novels. I'm not a super serious collector of primo condition early editions, but I do like the covers and to read earlier editions if I can get my hands on them. 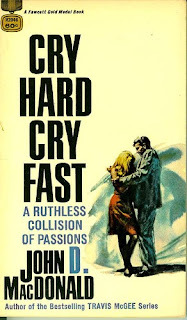 I did manage to get a nice clean copy of the 1958 second edition, which I look forward to reading. 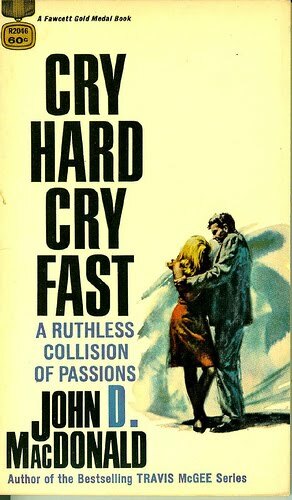 By the way, have you ever heard of an anthology of seven complete novels of JDM, all from the early 50s? I tried to buy a copy from a seller on Amazon, but it had apparently been sold and my money was returned. I have not come across any other references to such an anthology. Many thanks for your informative blog. Thanks Steve. I am unaware of any non-McGee novel anthologies being published, at least in the United States. Seven novels would make for a pretty heavy book! Hi Steve. I was referred to your blog by Chris Ogle after I posted a comment on his blog about Fawcett D1739. 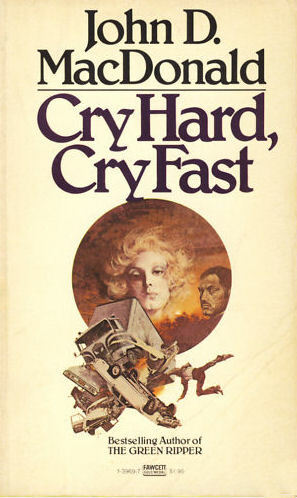 I said: "McGinnis did the cover for Gold Medal “Cry Hard, Cry Fast”, but not this one. He did M2906, P3510, 3969 and 12634. The cover art for D1739 was used again in 1969 on R2046 and the artist is unknown." 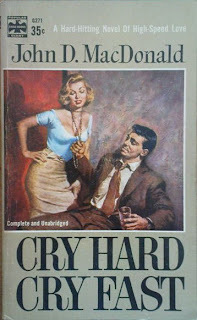 As I subsequently explained to Chris, I am NOT a McGinnis cover art expert. I got all my info from "The Paperback Covers of Robert McGinnis" by Art Scott and Dr Wallace Maynard. Thoughts, comments or sources for the argument supporting McGinnis? Steve, I'm not a cover art expert either. When identifying cover artists for JDM novels I refer to Walter and Jean Shine's 1988 bibliography A MACDONALD POTPOURRI. According to them, all your info about McGinnis' covers and editions are correct, as is the unknown identity of the creator of D1739. Thanks Fred, that's good to hear. Hopefully I'll get to see it one day.